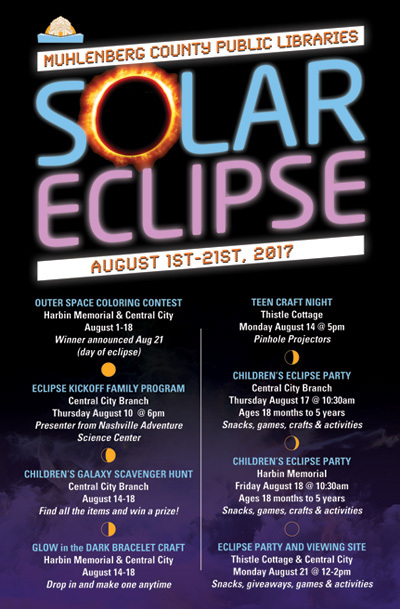 I created this event poster design for the 2017 Solar Eclipse. 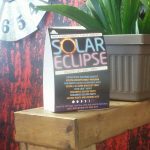 Longtime clients MCPL were planning a series of events for patrons at their three branches, which were themed around the eclipse. As such, the library commissioned me to make the advertising campaign art. This included this 11×17″ poster, newsprint ads, and table tents. Since I had created promotional materials in a variety of formats in the past, they asked me to also design frames for Snapchat and Facebook Live. This was a first for me, and I jumped at the chance. These frames go over visitors’ photos when they post about the events on social media. The library gave me carte blanche to make the perfect promotional items for this once in a lifetime happening. I began by selecting the perfect stock image of a solar eclipse, and Photoshopped out the surrounding elements in order to incorporate it into the main title. The Neo Sans font I used is perfect for a futuristic or space themed piece. I styled it in neon glowing colors to complete the feel. I also used the Synchro LET font to add a digital feel to the subtitles. The rest of the headings display in bright blue and orange, popping off the mysterious purple space clouds in the dark background. Finally, I added some simple icon images of eclipse phases in between information about each activity. The library staff were pleased at the party feel this ad campaign conveyed. Is your organization planning a big event? I am the perfect choice for your event poster design, since I have years of experience in a variety of print and web applications. Contact me today to help you get the word out in print or online.